The circulatory system is the continuous system of tubes that pumps blood to tissues and organs throughout the body. The pulmonary circulatory system circulates deoxygenated blood from the heart to the lungs via the pulmonary artery and returns it to the heart via the pulmonary vein. The systemic circulatory system circulates oxygenated blood from the heart around the body into the tissues before it is returned to the heart. The arteries divide into thin vessels called arterioles, which in turn divide into smaller capillaries that form a network between the cells of the body. The capillaries then join up again to make veins that return the blood to the heart. The flow of blood along arteries, arterioles and capillaries is not constant but can be controlled depending upon the body’s requirements. Vascular resistance generated by the blood vessels must be overcome by blood pressure generated in the heart to allow blood to flow through the circulatory system. vasodilation: The opening of a blood vessel. flow: The movement of blood around the body, closely controlled by alterations in resistance and pressure. vasoconstriction: The closing or tightening of a blood vessel. resistance: The resistance which must be overcome by pressure to maintain blood flow throughout the body. pressure: The force which overcomes resistance to maintain blood flow throughout the body. The circulatory system is the continuous system of tubes through which the blood is pumped around the body. It supplies the tissues with their nutritional requirements and removes waste products. The pulmonary circulatory system circulates deoxygenated blood from the heart to the lungs via the pulmonary artery and returns it to the heart via the pulmonary vein. The systemic circulatory system circulates oxygenated blood from the heart around the body into the tissues before returning deoxygenated blood to the heart. Pulmonary circulation: Pulmonary circulation is the half of the cardiovascular system that carries oxygen-depleted blood away from the heart to the lungs and returns oxygenated blood back to the heart. 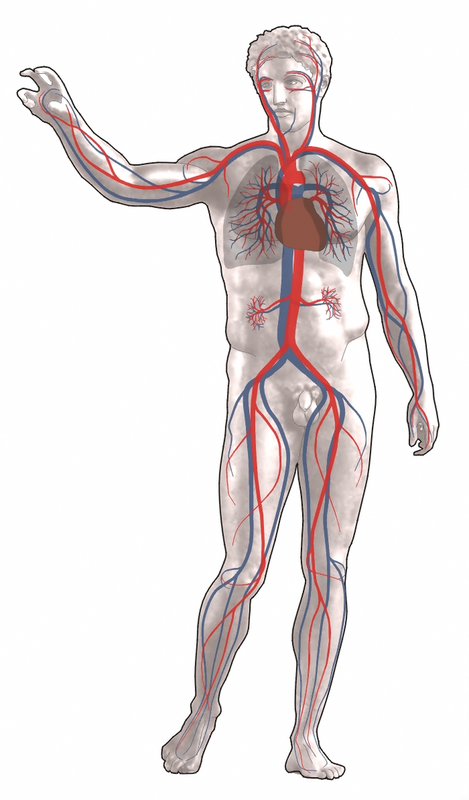 Three key factors influence blood circulation. Resistance to flow must be overcome to push blood through the circulatory system. If resistance increases, either pressure must increase to maintain flow, or flow rate must reduce to maintain pressure. Numerous factors can alter resistance, but the three most important are vessel length, vessel radius, and blood viscosity. With increasing length, increasing viscosity, and decreasing radius, resistance is increased. The arterioles and capillary networks are the main regions of the circulatory system that generate resistance, due the small caliber of their lumen. Arterioles in particular are able to rapidly alter resistance by altering their radius through vasodilation or vasoconstriction. The resistance offered by peripheral circulation is known as systemic vascular resistance (SVR), while the resistance offered by the vasculature of the lungs is known as pulmonary vascular resistance (PVR). Blood pressure is the pressure that blood exerts on the wall of the blood vessels. The pressure originates in the contraction of the heart, which forces blood out of the heart and into the blood vessels. If flow is impaired through increased resistance then blood pressure must increase, so blood pressure is often used as a test for circulatory health. Blood pressure can be modulated through altering cardiac activity, vasoconstriction, or vasodilation. Flow is the movement of the blood around the circulatory system. A relatively constant flow is required by the body’s tissues, so pressure and resistance are altered to maintain this consistency. A too-high flow can damage blood vessels and tissue, while flow that’s too low means tissues served by the blood vessel may not receive sufficient oxygen to function. Humans have a closed cardiovascular system, meaning that blood never leaves the network of arteries, veins, and capillaries. In humans, blood is pumped from the strong left ventricle of the heart through arteries to peripheral tissues and returns to the right atrium of the heart through veins. After blood returns to the right atrium, it enters the right ventricle and is pumped through the pulmonary artery to the lungs, then returns to the left atrium through the pulmonary veins. Blood then enters the left ventricle to be circulated through the systemic circulation again. The closing of blood vessels is termed vasoconstriction. Vasoconstriction occurs through contraction of the muscular walls of vessels and results in increased blood pressure. Vasoconstriction is important for minimizing acute blood loss in the event of hemorrhage as well as retaining body heat and regulating mean arterial pressure. Dilation, or opening of blood vessels, is termed vasodilation. Vasodilation occurs through relaxation of smooth muscle cells within vessel walls. Vasodilation increases blood flow by reducing vascular resistance. Therefore, dilation of arterial blood vessels (mainly arterioles ) causes a decrease in blood pressure. vasoconstriction: The constriction of the blood vessels. vascular resistance: The resistance to flow that must be overcome to push blood through the circulatory system. The resistance offered by the peripheral circulation is known as the systemic vascular resistance (SVR), while the resistance offered by the vasculature of the lungs is known as the pulmonary vascular resistance (PVR). vasodilation: The dilation of the blood vessels. mean arterial pressure: The average arterial pressure during a single cardiac cycle. Humans have a closed cardiovascular system, meaning that the blood never leaves the network of arteries, veins, and capillaries. Blood is circulated through blood vessels by the pumping action of the heart, pumped from the left ventricle through arteries to peripheral tissues and returning to the right atrium through veins. It then enters the right ventricle and is pumped through the pulmonary artery to the lungs and returns to the left atrium through the pulmonary veins. Blood then enters the left ventricle to be circulated again. Pulmonary circuit: Diagram of pulmonary circulation. Oxygen-rich blood is shown in red; oxygen-depleted blood in blue. Distribution of blood can be modulated by many factors, including increasing or decreasing heart rate and dilation or constriction of blood vessels. Blood distribution: Oxygenated arterial blood (red) and deoxygenated venous blood (blue) are distributed around the body. Vasoconstriction is the narrowing of the blood vessels resulting from contraction of the muscular wall of the vessels, particularly the large arteries and small arterioles. The process is the opposite of vasodilation, the widening of blood vessels. The process is particularly important in staunching hemorrhage and acute blood loss. When blood vessels constrict, the flow of blood is restricted or decreased, thus retaining body heat or increasing vascular resistance. This makes the skin turn paler because less blood reaches the surface, reducing the radiation of heat. On a larger level, vasoconstriction is one mechanism by which the body regulates and maintains mean arterial pressure. Substances causing vasoconstriction are called vasoconstrictors or vasopressors. Generalized vasoconstriction usually results in an increase in systemic blood pressure, but it may also occur in specific tissues, causing a localized reduction in blood flow. The extent of vasoconstriction may be slight or severe depending on the substance or circumstance. Vasodilation refers to the widening of blood vessels resulting from relaxation of smooth muscle cells within the vessel walls, particularly in the large veins, large arteries, and smaller arterioles. The process is essentially the opposite of vasoconstriction. When blood vessels dilate, the flow of blood is increased due to a decrease in vascular resistance. Therefore, dilation of arterial blood vessels (mainly the arterioles) causes a decrease in blood pressure. The response may be intrinsic (due to local processes in the surrounding tissue) or extrinsic (due to hormones or the nervous system). Additionally, the response may be localized to a specific organ (depending on the metabolic needs of a particular tissue, as during strenuous exercise), or it may be systemic (seen throughout the entire systemic circulation). Substances that cause vasodilation are termed vasodilators.